A few years ago, I was looking for a version control system that would be easy to implement and not cost a fortune. I was splitting my time between my laptop and my desktop, and was always forgetting my thumb drive somewhere else. I did not have a separate NAS device at the time, so that was out of the question. I was paying for shared hosting, and was greatly underutilizing my disk space allotment. Enter FtpVC, a version control system that works via FTP. It was perfect for my needs! I installed the client on both machines, configured it to use a folder on my hosting account, and got back to work. Setup was very easy, and the shared hosting space was accessible to either machine, and offsite. At $50, it was not a budget breaker, either. All the usual version control features are there, including history and comparisons. If you’re a lone ranger picking up the odd client job, or a small development shop, FtpVC could be a great solution for you. There’s a new version out, and their announcement e-mail reminded me I should blog about it. No relation other than happy customer. As a matter of fact, I’ve since moved on to another solution, but I still recommend FtpVC as a lightweight and inexpensive way to get into version control. Shiny new thing to eat up bandwidth! I’m a solo developer in a corporate environment, so I’m really on my own to learn new things. As good as blogs and books are, there’s sometimes no substitute for being shown how. That’s why Microsoft highlights so many videos on its asp.net site. ASP Alliance also has a growing library of videos. Enter onto this list one more site–DotNetVideos.net. Right now there are around 100 videos on a great number of topics. Apparently there are a couple hundred more in the pipeline. And, if you sign up now, you get 6 months of ASP.NET Pro magazine for free. That alone is worth the sign-up. ASP.NET Pro is one of my favorite trade mags (I have an online subscription, and have for several years). When you’re Googling for info on whatever you’re working on, don’t forget to check out this site, too, and see if someone is showing you how it’s done. Full disclosure: I was asked to say something about the new site, and I usually ignore such requests. But after checking it it, it’s one I’ll be spending some time on, and recommending to others. The flippin’ awesome Ankh Subversion plug-in for Visual Studio has its 1.0 Final release the other day. Official post at http://arildf.spaces.live.com/blog/cns!E99F8B43533149B0!221.entry. Download from http://ankhsvn.tigris.org/servlets/ProjectDocumentList?folderID=7315, you want the 2727-Final build (list isn’t in order). Congrats and thanks to Arild for a great tool. 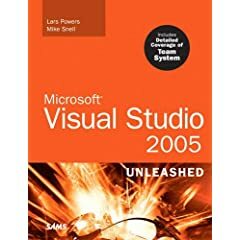 After a couple of publishing delays, I received my copy of Visual Studio 2005: Unleashed a week or so ago (ordered for Christmas 2005). The first thing you notice when you pick up this book is that itâ€™s GINORMOUS. No jokeâ€”832 pages of VS 2005 goodness. Iâ€™m not done with it yetâ€”not by any stretch of the imagination. That would require a diet much higher in fiber. But, like all books in the Unleashed series, this one is well written, with copious code samples and illustrations. Code samples, you ask? Oh yes, there are some. Aside from the chapter on language enhancements in C# and VB.NET, there are examples for creating your own code snippets, writing Visual Studio 2005 add-ins, and creating templates you can share with the community. How-toâ€™s are illustrated with screenshots. Informaion Iâ€™m eager to dig into includes refactoring, unit testing and managing databases via VS 2005. Iâ€™ll have a more formal review once I reach the end. seems. But vote for your favorite and encourage the dev. sometimes I only use 6 fingers). was generated by a tool. There is one correction to the article–Listing 4 is incorrect. Find the full article at http://aspalliance.com/839.